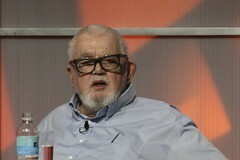 27 October 2011, 01:01 a.m.
John McCarthy, creator of LISPA family of programming languages designed to facilitate artificial intelligence. The name is short for "LISt Processing". The language was created in 1958., and father of modern artificial intelligenceAn attempt to make computers work/talk/act like people. Traditional definitions included a simple test that if a person dealing with a computer, for example via a keyboard and monitor, could not tell that there was a computer on the other end, then it was artificial intelligence. Modern definitions are more strict. (AIAn attempt to make computers work/talk/act like people. Traditional definitions included a simple test that if a person dealing with a computer, for example via a keyboard and monitor, could not tell that there was a computer on the other end, then it was artificial intelligence. Modern definitions are more strict.) died today. He was one of the first guys to work seriously on getting computers to do things that you wouldn’t normally have expected computers to do, like play Chess or have a conversation. One of the most common AIAn attempt to make computers work/talk/act like people. Traditional definitions included a simple test that if a person dealing with a computer, for example via a keyboard and monitor, could not tell that there was a computer on the other end, then it was artificial intelligence. Modern definitions are more strict. applications programmers have played with over the years is Eliza. Like others at the time, one of my first attempts at writing an interesting piece of software in my youth was to alter an Eliza program written in BASICBeginners All Purpose Symbolic Instruction Code. A programming language designed specifically for beginners. (as taken from the pages of Creative Computing, for all you old-timers). Eliza is a simple software psychoanalyst created in the 60′s by Joseph Weizenbaum. While Eliza wasn’t written by McCarthy, she was certainly a product of his inspiration on the industry. Ever since the new iPhone came out with Siri, the digital assistant, I’ve been thinking about comparing her to Eliza. The death of McCarthy brought the topic to my mind again. I’ve put together a small comparison of questions and answers from Siri and Eliza. Note that with Siri, your mileage may vary, she doesn’t always answer the same way. I’ve obviously skipped most of the “useful” things that Siri can do, as it would be an unfair comparison for poor old Eliza, who doesn’t have all the modern advantages that Siri does. It’s interesting because while they share a common logical bond, their personalities are very different. Siri was designed to be helpful and amusing. Eliza was specifically designed not to be helpful, in that she’s supposed to be a therapist and lead you to your own conclusions rather than give you answers. For the samples below I used a java version of Eliza that you can try for yourself on the web. E: You believe I can help you don’t you ? E: Why do you ask ? E: Why are you concerned over my favorite composer? S: I guess I don’t have one. E: Why are you interested in whether I am married or not ? E: I am not interested in names. S: My name? It’s Siri. E: What makes you think I am beautiful? E: Perhaps in your fantasies we love each other. E: Does that question interest you? E: What is it you really wanted to know? E: I’m not sure I understand you fully. or other answers depending on the time of day. Q: Can you send a message to my brother? S: I don’t know who your brother is, To whom shall I send it, I need a contact name, phone number, or email address. orWhat do you want to say to ____ (your brother)? I’m not sure about all of the reasons they’re so different. Sure, the state of the art in AIAn attempt to make computers work/talk/act like people. Traditional definitions included a simple test that if a person dealing with a computer, for example via a keyboard and monitor, could not tell that there was a computer on the other end, then it was artificial intelligence. Modern definitions are more strict. has come a long way since the 60′s. Or is it just that men’s expectations of women have changed? I was tempted to write that perhaps people are more friendly or helpful now than in the 60′s but that’s ridiculous. Perhaps it’s only that computers are now more helpful and friendly than they were. Is it possible that Eliza’s seeming bad mood had something to do with her obvious handicaps in memory and CPUThe CPU or Central Processing UnitThe CPU or Central Processing Unit is the key brain of the computer, it's the part where most computation is actually done. is the key brain of the computer, it's the part where most computation is actually done.. Maybe she was aware of this, and it caused her to be ill-tempered? In any case, Eliza comes across as a bit cynical, while Siri is much more light-hearted most of the time. Siri’s mood can definitely change as you can see from some of the answers. It occurs to me that it would be funny to get Siri to talk to Eliza – would Eliza help Siri, or would Siri end up making Eliza more friendly? So if your computer was nice to you today, thank John McCarthy. AI Smackdown – Siri vs Eliza originally appeared on The Code Curmudgeon on October 24, 2011.